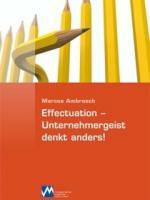 The logic of entrepreneurial activity (Effectuation) explains how entrepreneurs create new markets, products and opportunities. Discover their entrepreneurial spirit and make the future! Effectuation was founded by Saras D. Sarasvathy and has been researched more than a decade. Experienced entrepreneurs think and act beyond causal management thinking. For special they are running on top form here, if the uncertainty is high and the low goal orientation. The book not only provides an insight into the state-of-the-art knowledge of entrepreneurship research, but defines them and makes them practically applicable. The basics of how entrepreneurs and managers think, creativity and innovation lead to the description of the dynamic model and the five principles of Effectuation. Here, the relevant factors in the creation and development of markets, organizations and products are described, for example, also includes the failure to success. An additional benefit of the author offers a detailed look at other fields of practice in strategic management, agile project management and organization, teaching entrepreneurship, marketing and management in the field of innovation. A book that inspires your entrepreneurial spirit with new inspiration and is suitable not only for entrepreneurs and managers.